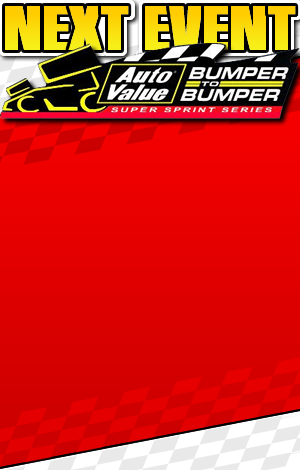 It was a very exciting day at Baer Field for the first of two events to determine the Championship of the Auto Value Bumper to Bumper Super Sprint Series for 2018. Afternoon qualification had Aaron Pierce as the top qualifier with a 14.957 on the half mile track. Brian Gerster and Ryan Litt, our two points leaders posted a 15.179 and 15.196 respectfully for the 2 and 3rd spots of the qualification round. The remaining top 6 were local driver Chris Neuenschwander, Jason Blonde and Jason Cox setting up the 3 heat races. In the first heat, Chris Jagger on the pole with Derek Snyder to his right followed by Chris Neuershwander, Aaron Pierce, and Tom Patterson. Snyder got off to a good start and led for the first 3 laps with Aaron Pierce following close behind and passing Snyder on the outside to take the lead and continued to gain more distance on the field and capturing the check flag with Snyder, Neuescwander, Jagger and Patterson. Second heat had Jim Payne on the pole with Kevin Feeney to his right side, followed by Jason Blonde, Brian Gerster and Teddy Alberts. On the start Payne brought the field to the line slowly and took off to take the lead followed closely by Feeney. Gerster came up quickly on the outside to capture the second spot and then the first spot to take the lead and never look back as he continued to expand this lead every lap. Blondes dirt track experience paid off twice for him as he got loose and went to the infield, saving it and bringing it back on the track. Later, on the last lap as he was avoiding a piece of Payne’s car he ended up going off the turn 3-4 to the outside of the track keeping it upright as he went don the hill spinning. Your race winner was Gerster, followed by Payne, Feeney, Alberts, and Blonde. Third heat had Christian Koehler on the pole with Tom Geren, Jason Cox, Ryan Litt, and Doug Dietsch (who didn’t start as they worked on the car for the feature.) On the start Koehler took off leading every lap as he continually slammed the door on Litt on each of the 3 attempts to pass him in the 8-lap heat. In lap 6 as they were coming out of turn 2 side by side, Litt went off the track and came back on saving the car. Koehler achieved his first sprint car win with AVBBSS, followed by Litt, Cox and Geren. The feature was just as exciting as the heats. The crowd was very excited and pleased with the first three races and wanted more. Kevin Feeney and Derek Snyder were the front row followed by Jason Cox, Jason Blonde, Chris Neuenschwander, Ryan Litt, Brian Gerster, Aaron Pierce and a field of 7 other superstars of the AVBBSS series. On the start, Snyder and Feeney stayed side by with Snyder slightly leading each lap through lap 3 where Snyder was able to get in front of until Jason Blonde came by on the outside to take the lead. Blonde led for several laps followed by Pierce until lap 12 when traffic allowed Pierce to pass under Blonde to the lead. At the half way point it was Pierce, Gerster and Neuenschwander when Gerster and Neuenschwander connected causing Neuenschwander to the infield. Gerster also left the track to change a tire. On the restart, Pierce, Blonde, Litt, and Snyder lead the pack for the remaining 14 laps. Litt spun in turn four of the restart, causing another caution and a complete restart, Litt ended up leaving the race before the restart. During this caution Feeney left the track for a change and returned to the rear of the field. On the restart Gerster shot up thru the field and quickly went to fifth as Cox moved up to third. At the checker it was Pierce, Blonde, Cox, Snyder, Gerster, and Feeney for your top six finishers. The points leaders are Brian Gerster, with Ryan Litt only 4 points back and Snyder in third, our champion will not be decided until we see how all of them do on the final race at Baer Field on October 20th.